Like many people in Mvskoke country (and many more in the American South), I grew up eating corn on the cob, white and yellow hominy, homemade cornbread, and the occasional boiled or fried hominy grits. Vce, which the Europeans called “maize” or simply “Indian corn,” is the quintessential staple of Mvskoke cuisine. It may also be Native North America’s greatest contribution to the world’s domesticated food supply. Having spent most of my adult life as a university professor, I enjoyed the academic freedom to study the cultural and ecological traditions of my Mvskoke forebears. 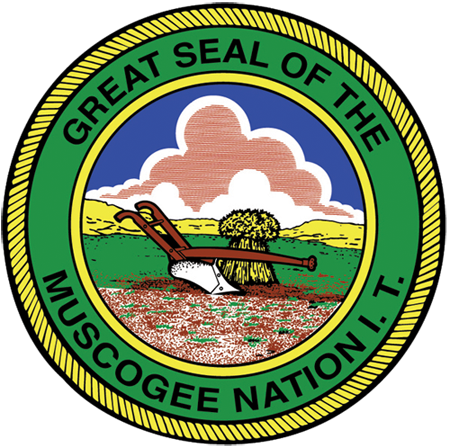 In 2009 I began writing a monthly column for the Muscogee Nation News titled “Mvskoke Country,” which is archived on the internet at MvskokeCountry.online. Each installment offered a topical perspective on enduring themes in human ecology; I tried to connect local concerns with global realities and to reconnect Mvskoke traditions with the natural world. Many columns incorporated insights gained from a close study of the Mvskoke language, which bears evidence of ecological decline in the historical period. One of my earlier pieces, written in response to a reader’s query about traditional Mvskoke recipes, posed the question “What Is Mvskoke Food?” That’s a slippery word, “traditional,” pointing back in time toward the dim corners of collective memory, like a flickering flashlight aimed into a very deep cave. How far do you have to go? How long does it take to make a tradition? These are tough questions in a modern world where things are always changing, and people are more interested in the latest gadgets for sale than the timeless truths of their ancestors. Over the years I’ve tracked down more than two dozen publications containing instructions for processing and preparing traditional Mvskoke dishes—foods and drinks that were popular before the rise of industrial technology and that are named in the Mvskoke language. The most informative of these printed sources is Hokti’s Recipe Book of Creek Indian Foods, written by Beulah Simms and published by Ben Chaney in 1970. Beulah dedicated her book to the next generation of Mvskokvlke, hoping “to inspire a revival of interest in the old methods of preparing food,” particularly among “those hardy individuals who have the initiative, curiosity, and fortitude to try these recipes.” Preserved here are the ingredients, utensils, and preparations used by Mvskoke cooks for countless generations, before the advent of “modern kitchen conveniences.” Practicing “the old Creek Indian ways of cookery” involves handmade implements fashioned from wood and other natural materials; Hokti’s recipes are prefaced by a survey of several such utensils. Not surprisingly, many of the twenty recipes collected here include vce. 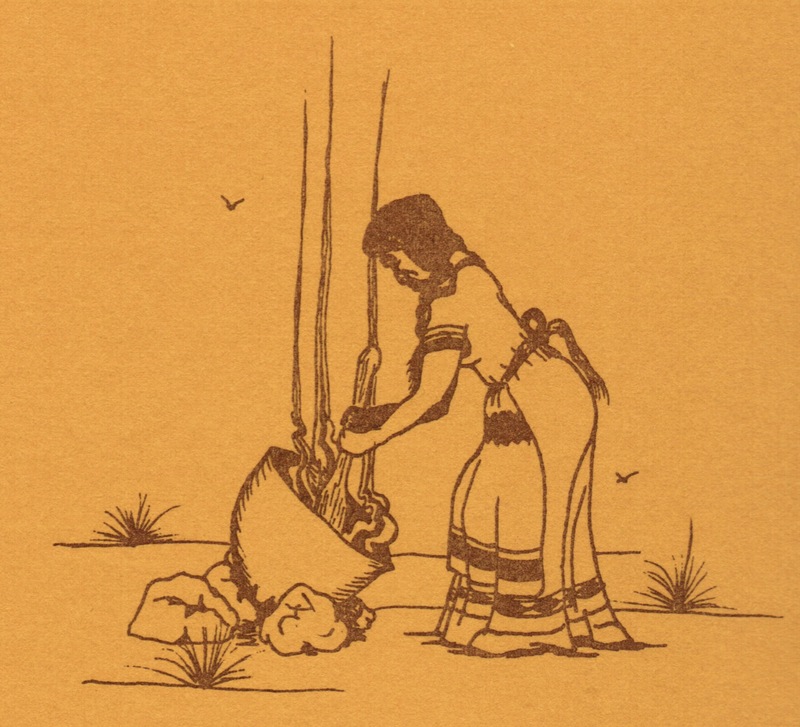 As Beulah points out, the survival of Green Corn and other observances rooted in agriculture demonstrates the importance of both crop and ceremony in Mvskoke life. Other ingredients listed in these recipes may be harder to find at your local grocer—wood ash lye, possum grapes, sassafras root bark, and squirrel, for example. You’ll probably have better luck if you know your way around “Nature’s Super Market,” as Beulah terms it. Some of these recipes call for flour, eggs, pork, or beef—foods that have become common, if not necessarily healthy, elements of the modern diet. Wheat, chickens, pigs, and cattle are not native to Mvskoke country; they were domesticated in the Eastern Hemisphere and transplanted to the Americas as part of the European invasion. So Hokti’s Recipe Book documents Mvskoke culinary traditions during a particular period of our history, after the onset of colonial trade but before we got hooked on mega-marts and drive-thrus. For example, the recipe for tafvmpuce [see below] consists of wild onions, which are still gathered in the wild today by este Mvskoke; bacon grease, which is a substitute for wild game fat obtained through hunting; eggs (from chickens), which replace eggs produced by domesticated turkeys or gathered from wild bird nests; and water and salt, which are still available in the wild but more commonly purchased from public or private sources. The wild onion dinners held throughout Mvskoke country every spring are serving up a tasty dish that embodies the entire history of Mvskoke subsistence practices—gathering, hunting, domestication, trade, and modern commerce. In 2010 I caught up with Ben Chaney, who was then managing the Department of Transportation of the Muscogee (Creek) Nation after an eclectic career in art, education, and business. He told me about drawing the illustrations for Hokti’s Recipe Book and printing it in his Okmulgee garage as a young man, and he gave me permission to publish an electronic version of the book on the “Mvskoke Country” website. In February 2018, at the venerable age of 76, Ben returned to work for the Nation as Secretary of Interior Affairs, overseeing thirteen departments serving MCN citizens and area residents. Unfortunately, his tenure was cut short by his unexpected death six months later. Beulah had died many years earlier, in 1987, and her mother “Hokti”—Peggie Berryhill King, an original allottee—died in 1996; both were buried in the Tallahassee Church Cemetery in Okmulgee alongside many of their Mvskoke relatives. The public response to the online republication of Hokti’s Recipe Book has been truly remarkable. Over the past decade, I have posted more than a hundred columns, field notes, found poems, vintage recipes, book reviews, and other writings related to Mvskoke cultural and ecological traditions. Hokti’s Recipe Book of Creek Indian Foods is the most popular content ever published on the website, having been accessed over ten times as often as the second most popular page—the column in which I discussed this very source in response to a reader’s query about traditional Mvskoke recipes. Who would have guessed that Mvskoke people and their friends like to eat?! MVTO, Peggie, Beulah, and Ben. What is Mvskoke food? There are no simple answers in a complex, modern world. But it’s worth reflecting on this question because, as the saying goes, you are what you eat. Mvskoke people have survived by eating Mvskoke foods—and our foods survive by being eaten, just as our words survive by being spoken. Wild onions can best be found in early springtime or even late winter, as soon as the winter snows have melted and the ground has thawed. The onions have long, slender leaves and onion smell and are found on creek banks or in shaded, wooded areas. Dig up sufficient quantities; about four hands full. Pour off the water and add the bacon grease and cook until the onions are wilted. Add salt and the eggs and stir until the eggs are completely cooked. A Creek Indian has not fully prepared for the advent of summer until he has eaten his fill of wild onions in the spring, and it is even better if the meal has been shared with good friends. Shell black or white corn, put water in a pot to boil, set it over the fire, put in a small amount of strong ashes without any charcoal, and when it boils, put in the shelled corn, and after it boils, take out the corn, and wash it off until all the corn skin is removed. 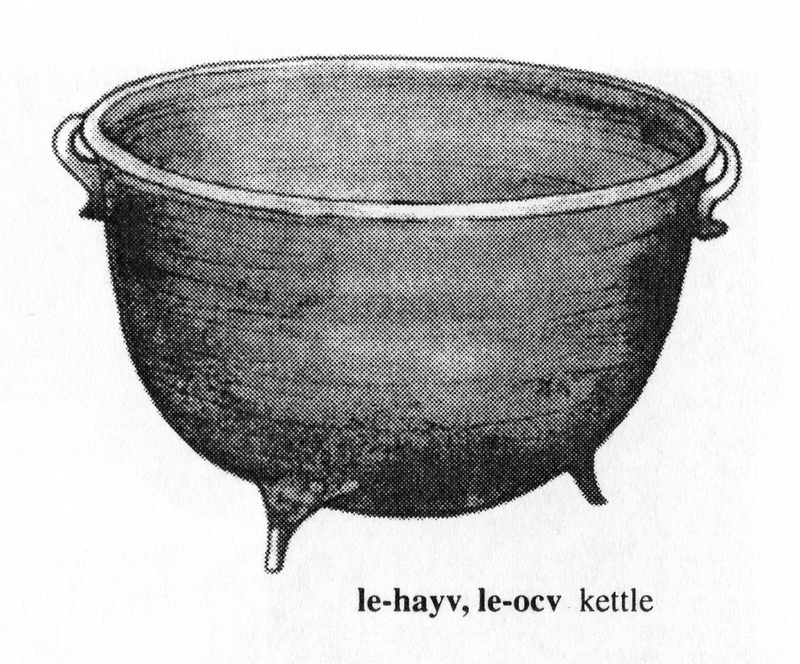 When the same corn was boiled and cooked without grinding, grease was added, and it was called sokv and eaten. From a wood fire, pull out one gallon of hot ashes and some small glowing embers. Put one quart white corn and the ashes into a large iron kettle. Arrange the kettle so that it is tilted to one side. It is easier to stir this way. Stir the corn and ashes over a low fire until the corn turns light tan in color. Separate the corn in a colander or a can with holes punched in the bottom. Pour water through the corn until the corn turns white and all trace of the ashes has been removed. Dry the corn and store for later use. Boil the desired amount of corn in water for approximately one hour until thoroughly cooked. Season with lard or pieces of pork for flavor (hogshead can be used for this). 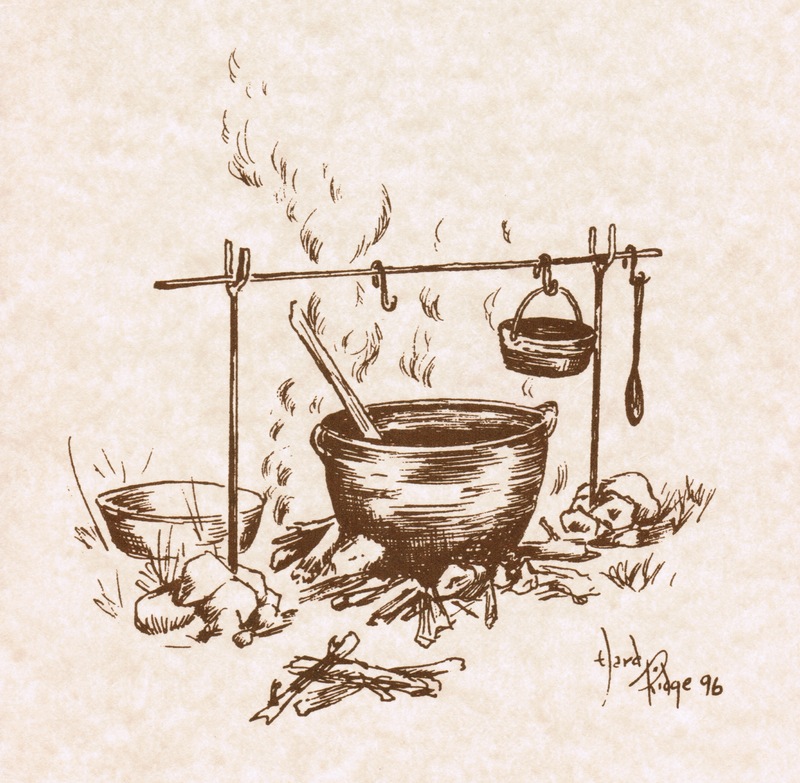 Take a half bushel bucket of squaw corn and half bushel bucket of strong ashes, about three buckets full of water heated in wash pot and bring to a boil. Add the sifted ashes and boil briskly, adding the corn and stirring it until it’s skinned, then wash until it’s clean. This is a large amount and can be used in different ways. Soak this overnight and cook very similar to beans. Also can be cooked together with hogshead. Another way it has been used is to cook hominy with salt pork and wild greens that Indians eat. These are the greens that are ready to eat right after the wild onions are gone. Add enough water to cover one quart wood ashes and bring to boil. Add one gallon shelled corn and bring back to boil. Boil for one-half hour stirring often. Pour out ashes and water. Rinse corn thoroughly four to five times in different water each time. Pour corn into clean pot, cover with water or broth from soup bone and cook until corn is done. Serve warm. 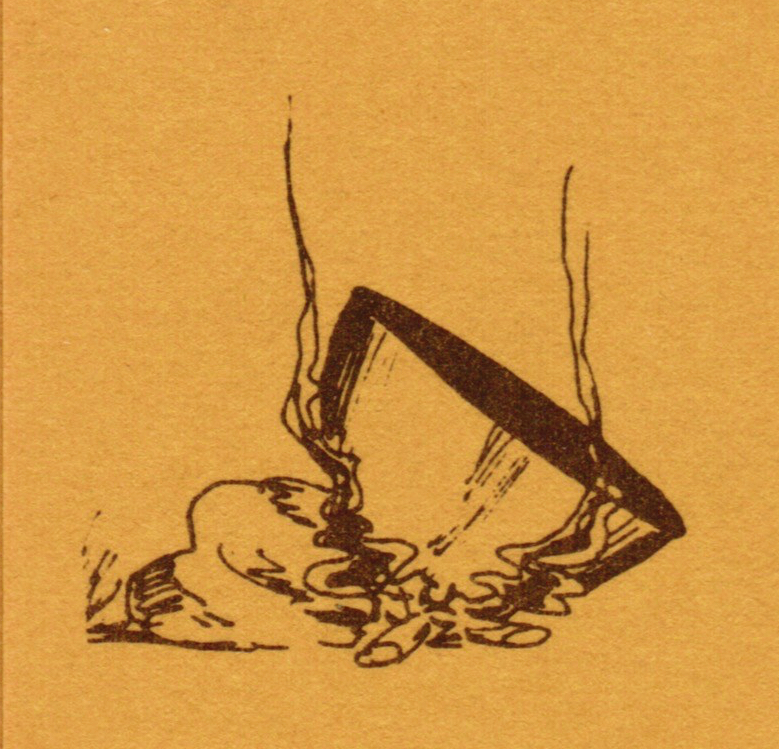 Boil two quarts dried shelled corn, two gallons water, and two ounces lye in iron cooking pot for thirty minutes. Set off and let sit for thirty minutes to cool. Rinse in cold water and remove skin and eyes. Put back in clean pot, add clean water and bring to boil, cook for five minutes. Empty. Repeat this two more times to remove all the lye. After last bath, cook again for thirty minutes. A traditional method for preparing hominy is to take clean wood ashes (hardwoods such as oak or hickory are best) sifted and put into an iron kettle (aluminum is never used for making hominy). Cover wood ashes and dried corn, removed from the cob, with water and boil until the skin slips off the corn. Wash the skins and ashes away with plenty of fresh water. The kernels are then boiled in fresh water until tender. 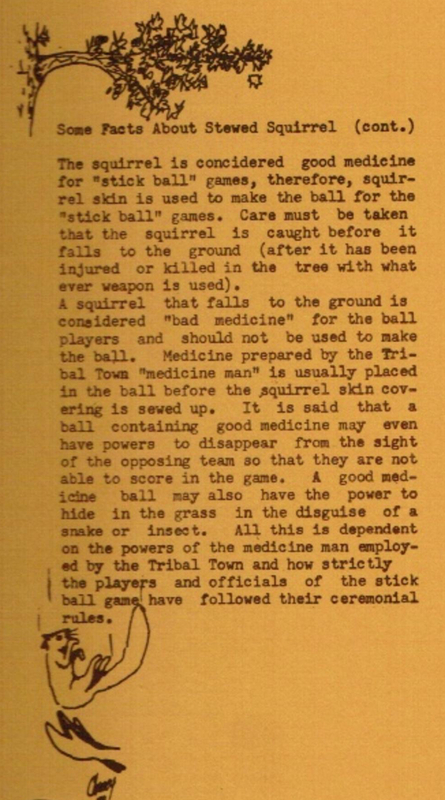 Dress squirrel and wash clean, place on fork or stick in front of open fire, turning often until thoroughly brown. Squirrel soup is made by first barbecuing squirrels whole, and then cut into pieces and place in vessel of cold water. Season with salt and pepper. Boil slowly and serve as broth. If they kill a lot of squirrels, they cooked them by boiling and ate them, but if it was just one, they singed off the hair by laying it near the fire and covered it with hot ashes, and when it was done, one person or even two used to eat it. Even now the squirrel is still very much eaten. Begin the cleaning of the squirrel by burning off all the hair over a direct flame. Scrape all the singed hair off. Remove skin, dress, clean, and cut into smaller pieces as you would a fryer. If the squirrel is old, boil in salt water until it is tender. Place about one tablespoon of lard in a frying pan and pan fry the squirrel over a low flame with the pan covered with a lid until slightly cooked. Pour in about one cup of water and simmer down until thoroughly cooked. Salt and pepper to taste. Some Creek tribal towns traditionally have stewed squirrel dinners before the first Stomp Dance of the season and after the last Stomp Dance of the season. Make a fire outside with dry limbs and place the squirrel into the fire, watching it very carefully not to burn. Burn only enough to singe the hair off, scrape and put back in fire long enough to brown and brittle the skin. Next wash and clean the squirrel, cut into pieces and cook in water. Season with salt and pork drippings and cook long enough to be real done and serve. Wash the squirrel well to remove all hair or fuzz. Cut a young squirrel into serving pieces. Rub with lard and salt. Roll in flour and fry in lard until brown. Add a few drops of water and cover. Steam for thirty minutes over a low fire. Remove squirrel from the pan and make gravy from the drippings. Brown two tablespoons of flour in four tablespoons of the fat in which the squirrels were fried. Cover with water and let cook until it is about medium thick. Old squirrels may be boiled until almost tender then fried in grease as young squirrels, except they are not to be rolled in flour. Serve with biscuits or fry bread. Cut two cleaned squirrels into serving pieces. Mix salt and pepper and one cup all-purpose flour, and dredge the squirrel pieces in the mixture. In a large skillet, heat six tablespoons lard or bacon drippings and fry squirrel pieces, turning occasionally until golden brown. Remove squirrel from the skillet and set aside. Pour off all fat except about three tablespoons. Add two cups water to the skillet and bring to boil. Return squirrel to the skillet; bring to boil again, cover, and reduce heat. Simmer for about one and one half hours or until the meat is very tender. Cut two squirrels into serving pieces. Place flour and salt and pepper in paper bag, place squirrel in bag and shake until coated. Fry in skillet in six tablespoons grease until golden brown, pour off excess grease and add two cups water. Bring to a boil, lower heat, cover and simmer for one hour.